Have you heard of upmarket make-up brand Chantecaille? Based in New York, the brand has a reputation for using natural botanical ingredients and supporting environmental causes. 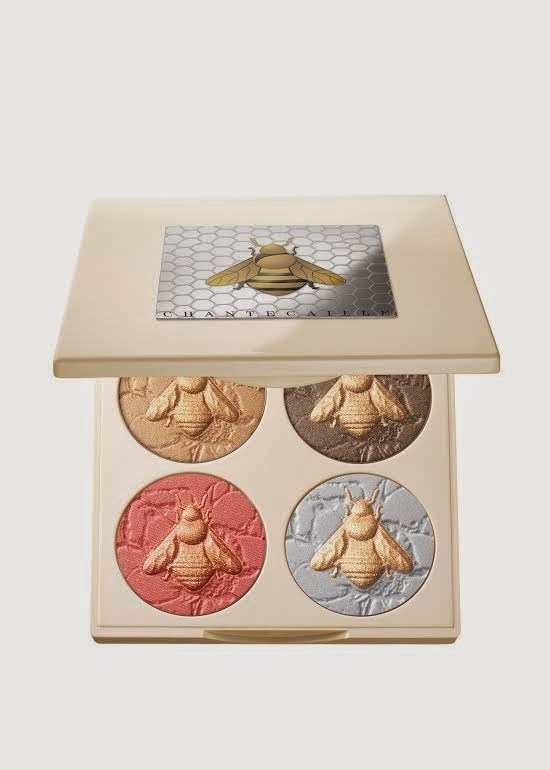 The Bumblebee Conservation Trust is the latest recipient of the brand's support, and you can do your bit by purchasing this gorgeous Spring palette with a lovely set of wearable colours and absolutely divine little bees imprinted into the powders. "The Bumblebee Conservation Trust was established because of serious concerns about the 'plight of the bumblebee'. In the last 80 years our bumblebee populations have crashed. Two species have become nationally extinct and several others have declined dramatically." I like the look of the palette for a lot of reasons - I switched to using mainly organic skincare products without petrochemicals a year or two ago, and haven't always been able to do this for the make-up I purchase. While this isn't certified organic, they do promise that all Chantecaille products 'are free of synthetic colors and fragrances, and do not contain any sulfate detergents, phthalates, nor petrochemicals'. Also, I can get a guilty feeling about buying such decadent things, and the environmental link here sits a bit better with my conscience. Finally, it's a family business headed by French matriach Sylvie Chantecaille. I feel more assured by French products in general (they tend to really know what they're doing!) and it's good to have a woman at the helm. Now the downside - I'm really sorry, it's £74!!! I could never justify that. I think I'm not the intended market! Ah well, if you are poorer of pocket like me, you could always head over to the Bumblebee Conservation Trust website and make a small donation, or help out by joining their bee-watch programme! Here in the UK, the palette is available at Harrods, Space NK, Liberty and Fenwick. Do you try and help environmental issues when you buy products? What do you think of palettes in general, do you buy them? This brand has crossed my radar as well, and while I think their products look and sound beautiful and like something I'd certainly enjoy using, they're far, far too rich for my blood as well. The price of that one wee compact of shadows alone is akin to what I usually spend on all my makeup and beauty items over the course of several months. I would take part in their bee watch program though - what a great idea! (It wouldn't be for my dear husband however, as he has melissophobia). Oh it looks really good and if it saves the bees... I have to try !